My daughter, the piano player, visited London and then embarked on a cruise in the Baltic Sea. There she played piano for the choral group on the ship and in six different countries. Her luggage was packed to the hilt, so I said “don’t bring me any souvenirs unless it’s yarn” knowing full well she would not find any. She was most proud to present me with a package of yarn on her return! She said I would love Estonia – “there are sheep everywhere!” She ventured into a yarn shop and didn’t have the slightest clue as to what to purchase. 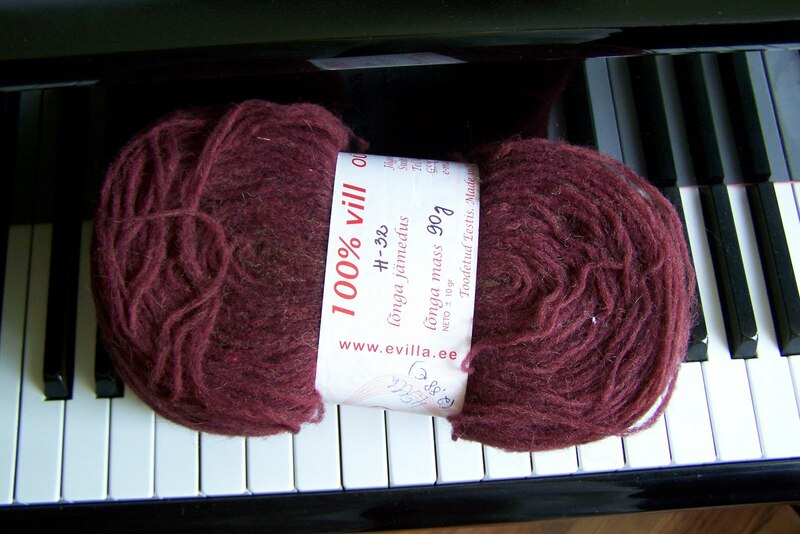 So she got me three skeins of the Baby Alpaca and two skeins of this Evilla Preyarn. I have two skeins of the Preyarn. Each has approximately 600 yards. It is an unspun yarn which pulls apart very easily. There are quite a few projects on Ravelry using this yarn – everything from shawls to sweaters to felted mittens. Some of the notes reflect how easily the yarn breaks but that, once knitted, the end result is strong. That’s where my knitting and spinning friends come in. Can you tell me how I should work with this yarn? Do you recommend a specific type of project? Some knitters used two strands. Any help you can offer would be greatly appreciated! I finally started my second swirl sock and recently cast on for an a-line baby sweater for my nephew and his wife’s expected baby girl. The pattern is like the bottom center one in the book above. 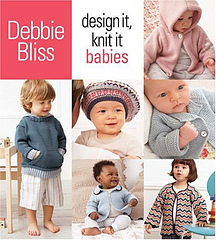 It is not listed as a pattern on Ravelry, but is similar to this pattern by Debbie Bliss. I picked up the latest Knitscene from the grocery store. I haven’t purchased a magazine for a while, but I was excited about some of the hats. Despite the old-fashioned, hot, hot, hot summer we are having, the promise of fall is around the corner. It’s time to also get back to work on my vest and cardigan and, perhaps, some of these smaller projects. Those little gloves are beautiful. When I made those felted slippers I used three strands to make sure they were thick and that the yarn would not pull apart… Have fun with your gifts! What a wonderful trip she must have had! What an exciting trip for your daughter! The cruise in the Baltic Sea must have been so interesting. I wish I had some advice for you, but I’m not familiar with that type of yarn. It might be nice to combine it with some Noro and make a big felted bag. Not sure what to do with the yarn; from the Ravelry reviews it doesn’t sound like it’s very soft. I don’t think I’d want a scratchy shawl. But it’s so cool that your daughter bought it for you. And I’m a sucker for piano/yarn photos. 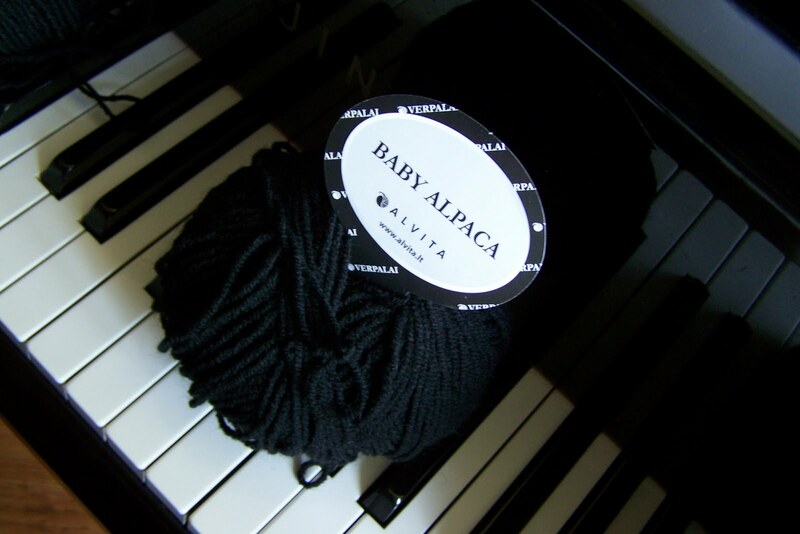 I take a lot of yarn photos on the piano…the white balance is perfect! I love, love, LOVE the new header!! !